We’ve been taking a bit of a break around the Miner household, enjoying the holidays. But, we’ve been drawing … and those are going up over the next few days. But, I thought I’d share one of the Christmas presents we gave Grace and Cate. 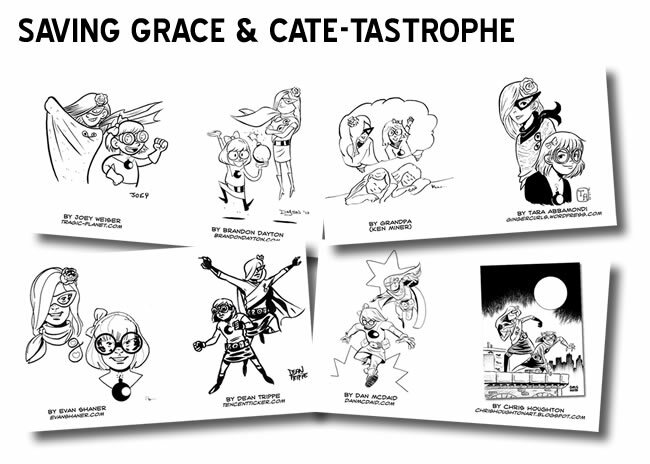 Over the past several months and weeks, I’ve worked with some amazingly talented artists — Tara Abbamondi, Dan McDaid, Chris Houghton, Evan Shaner, Dean Trippe, Brandon Dayton, Joey Weiser and Evan Shaner — to draw renditions of the girls as superheroes. Inspired by their personalities, they’ve been dubbed Saving Grace and Cate-Tasrophe. Grace loves to dance and help people. And, everything about Cate is, well, loud and vivid and exhuberant. As much as the girls and I will treasure all of this work for years to come, I must admit that my father’s contribution is my favorite. After all, he’s the one who got all this started by putting a pencil in my hand, drawing with me and bringing home a giant box of comics when I was very young. As a father, I could but pass the love of comics along. I’m sorry it’s been a week since the last post, but Grace was in a production of “The Nutcracker” (Yes. She’s the comic book reading, drawing ballerina.) … and we were consumed in that. 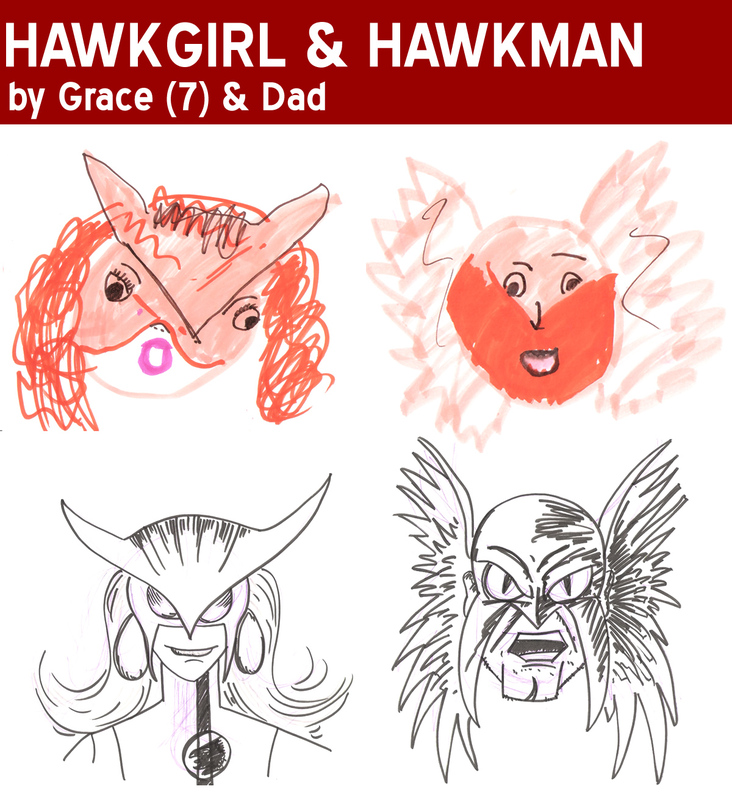 But, we did draw a new superhero idea of Grace’s — Mr. Sleepy. 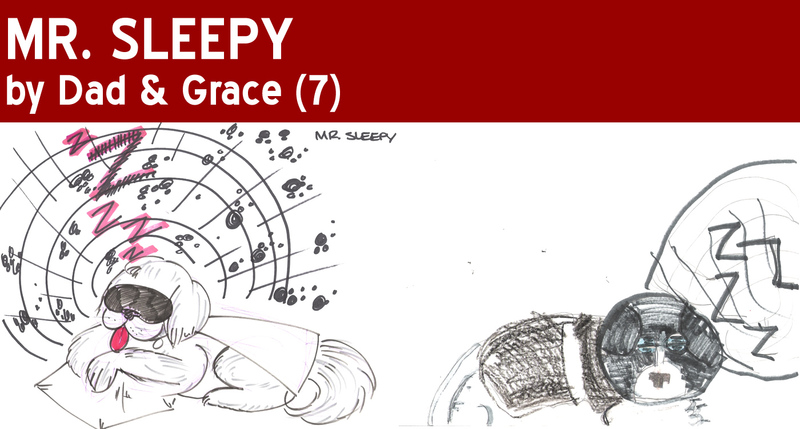 He’s a dog whose sonic snores put the badguys to bed. I will neither confirm nor deny that I am the inspiration of the snoring powers. 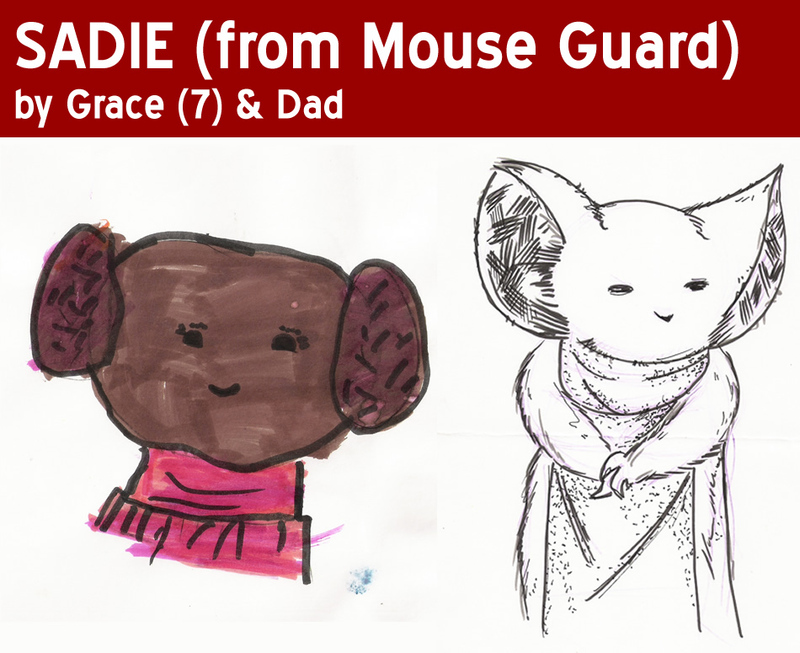 This one’s a few weeks old, but we decided to draw a tuff, but furry lady … Sadie of David Petersen’s Mouse Guard. 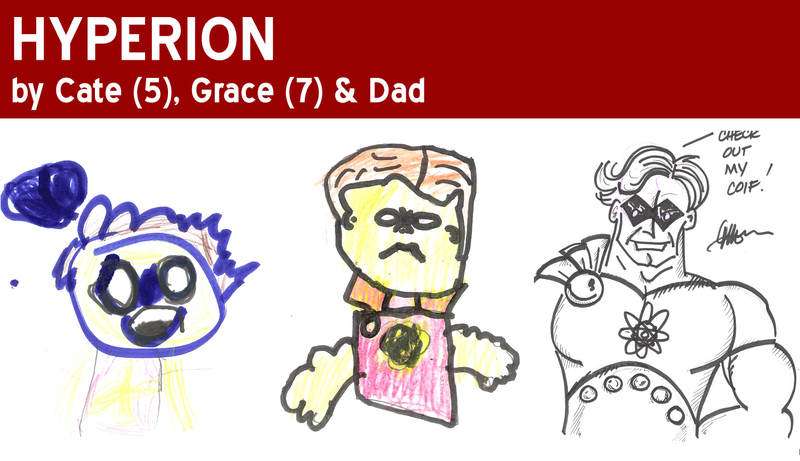 The guys over at Comic TWART are drawing Superman this week, so we thought we’d draw Marvel’s “homage,” to the Man of Steel — Hyperion of the Squadron Sinister/Supreme! And, Holy cats! Cate has come out of retirement to draw Hyperion. She was inspired by an episode of “Super Hero Squad.” Give her love, ya’ll. We need to keep her drawing. Grace and I did these a while back. 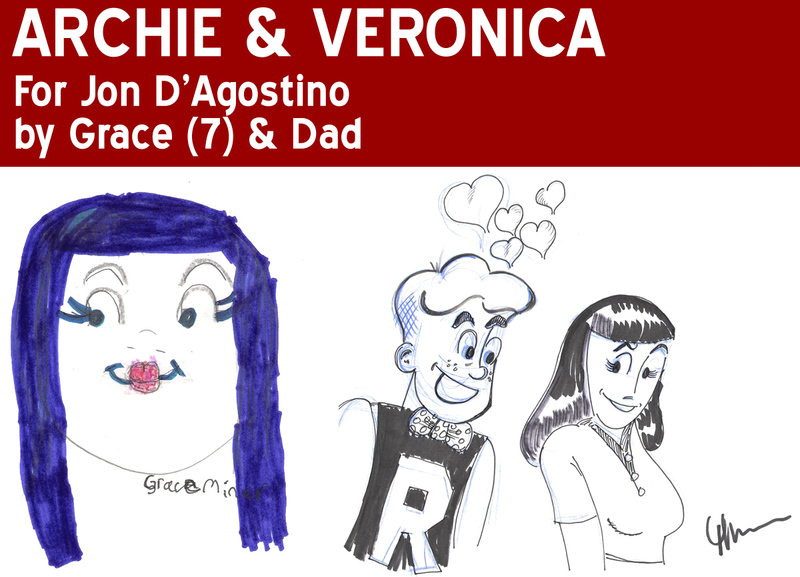 Grace’s main concern on these was experimenting with flesh tones … which she learned are very tricky. Been to the tanning bed recently Katar? On a personal note, I really do love the design of Hawkgirl’s costume. Like, a lot.